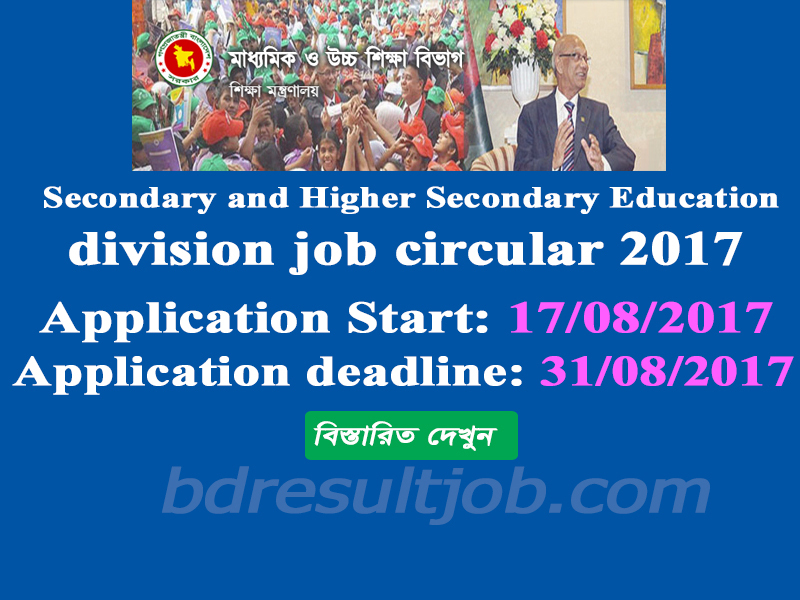 Secondary and Higher Secondary Education division job circular 2017 has been published at http://www.shed.gov.bd/. 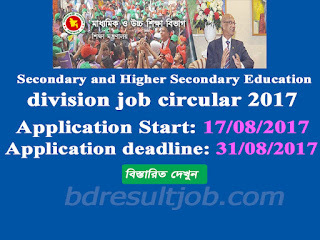 Secondary and Higher Secondary Education division jobs Apply online start on 17 August 2017 and Deadline 31 August 2017 at http://sesip.teletalk.com.bd/admitcard/index.php. Secondary and Higher Secondary Education division will recruit some personnel for various post. Bellow you have to see the details about this job circular. Online application must be through http://sesip.teletalk.com.bd/admitcard/index.php. a. Thana Secondary Education Officer: vacancies 1, Educational Qualification and salary: please see advertisement. b. Thana/Upazial Academic Supervisor: vacancies 17, Educational Qualification and salary: please see advertisement. c. Document Officer: vacancies 01, Educational Qualification and salary: please see advertisement. d. Assistant Inspector, vacancies 11, Educational Qualification and salary: please see advertisement. d. Research officer, vacancies 4, Educational Qualification and salary: please see advertisement. d. Assistant Programmar: vacancies 2, Educational Qualification and salary: please see advertisement. d. District Training Co-ordinator: vacancies 2, Educational Qualification and salary: please see advertisement. d. Assistant Thana Secondary Education Officer: vacancies 2, Educational Qualification and salary: please see advertisement. d. Computer Operator: vacancies 2, Educational Qualification and salary: please see advertisement. Every Interested candidates can Apply Online 2017 by this website at Apply Online. 2. Candidates must be Bangladeshi by born. 3. Applicants have to insert recent photo, photo size is 300*300. But not more than 100 kb. 4. They must upload own signature, signature size is 300*80 and file size is not more than 100 kb. And it should be jpg format. 5. Form fill up advertisement instruction carefully. Reply: Applicant’s Name, Tk-222/- will be charged as application fee. Your PIN is (8 digit number). Reply: Congratulations! Applicant’s Name, payment completed successfully for Secondary and Higher Secondary Education division. User ID is (xxxxxxxx) and Password (xxxxxxxx). Tags:sesip teletalk com bd. www sesip teletalk com bd. sesip teletalk bd com. SHEAD GOV BD COM. teletalk sesip. www sesip gov bd.